The beginning price will be about $1,500 per kilowatts, but once high production begins, the price should drop to 1,000. The main goal is to get the cost below $500 per kilowatts. Well the new fuel cell will be able to run on propane or gas and be 40% more efficient. 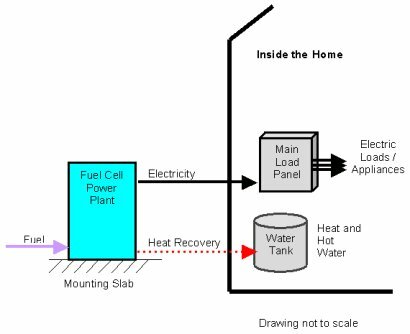 The excess heat can be captured and reused. This makes the fuel cell over 80% more efficient. Can I sell unused energy back to the power grid? Depending on the local government rules and regulations you can sell unused power to the electric company. What fuels do you usually use to power fuel cells? Different types of fuel cells require different fuels. The direct methanol fuel cell requires methanol. Others require hydrogen, which can come in the form of direct hydrogen or through the reformation of common fuels such as natural gas, propane, diesel or methanol. Operating costs will depend on many factors, including fuel choice, local fuel costs, and system efficiency and on whether electricity, or electricity and heat are used. But fuel cells are more efficient than many technologies already out there.